LOUISVILLE, Ky. — Did you know a store on UofL's campus allows you to 'shop' for free? 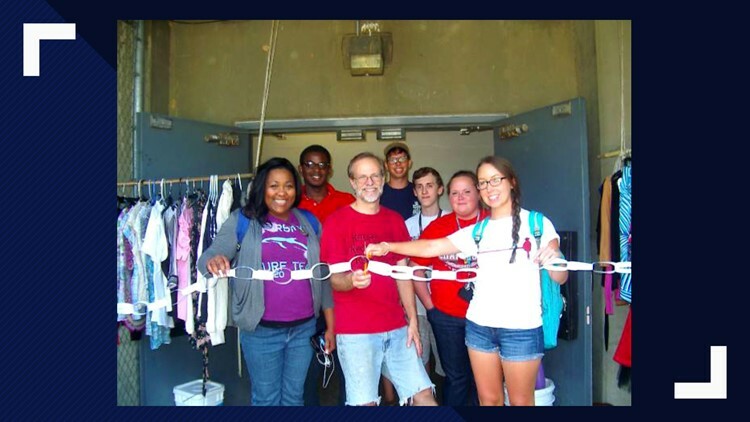 It's how the Free Store got its name when a group of students established it about 5 years ago, an all-volunteer effort organized by GRASS (Group Recycling and Sustainable Solutions) and the UofL Sustainability Council. The goal is to keep useful items out of the landfill, but it also ensures students, staff and area residents never go without. The doors open for a few hours every Tuesday through Friday below the Unitas Tower, off Cardinal Boulevard and 1st Street. It's a bit difficult to find if you aren't sure where to look. "You'll find clothes, shoes, books, household items. We have ornaments right now. Lots of cups and gloves sometimes. We have toys, because we get kids sometimes and they're excited about that," Erin Kurtz, a UofL graduate who helps oversee the store said. The Free Store is always looking for donations, whether new or gently used. Donation bins are stationed outside the store throughout the year. The idea - you give what you don't need and take what you do. In 2017, the UofL Free Store took in more than 700 pounds of donations which otherwise might have gone into the dumpster. UofL's free store is open Tuesday-Thursday from 11 a.m. to 1 p.m. and on Fridays from 2 p.m. to 5 p.m.
►Contact reporter Brooke Hasch at bhasch@whas11.com. Follow her on Twitter (@WHAS11Hasch) and Facebook.